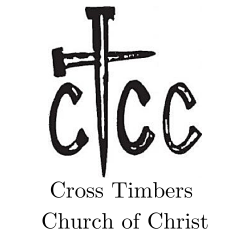 Cross Timbers Church of Christ in Stephenville, Texas is seeking a full-time minister who will partner with our congregation to support spiritual growth, while furthering our presence in our community. We believe in God’s grace and that Jesus Christ is the Son of God. Our congregation is made up of approximately 75 members, including numerous long-time families, in a community of 21,000 people. Our church family has 2 elders, 5 deacons, and 5 ministry leaders. We have a fledgling college ministry, along with a growing youth group. Cross Timbers is a somewhat progressive church: we are joined in worship with a praise team, and we encourage women’s participation in public worship in ways not typically found in Churches of Christ in this area. We meet for Bible study and worship services at the building on Sunday mornings, and meet for Bible study Wednesday evenings. On Sunday evenings, members are encouraged to participate in Life Groups where we fellowship, study God’s word, and pray for one another. We are searching for a minister who is immersed daily in God’s word, teaches Biblical truths, and is able to effectively communicate those truths in a manner that is applicable in today’s world. We seek a minister who is prepared to be fully engaged in the life of the church, will become an integral member of the community ministerial alliance and engage in community activities, will visit members in need, and will support our current ministries. In addition, we seek a minister who is an enthusiastic self-starter who is intent on encouraging spiritual growth and relationships within our congregation and within the Stephenville community. If God is calling you to serve with us at Cross Timbers, please email a cover letter and resume along with links, recordings or DVDs of recent sermons to applicants@crosstimberscofc.org.